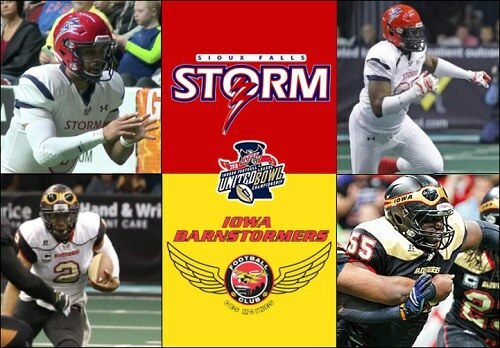 What: The Storm, appearing in their ninth straight United Bowl, visit Des Moines to face the Iowa Barnstormers, who are hosting the 10th installment of the Indoor Football League's championship game. When: Saturday, July 7 at 5:05 p.m. pacific (7:05 p.m. central). Stream: 2018 United Bowl on the IFL YouTube Channel. Note: This is a rematch of last season's United Conference Championship Game, which was won by the Storm, 66-32. Sioux Falls went on lose to the Arizona Rattlers in last season's United Bowl, 50-41. The Storm finished the regular season 11-3 and 4-2 on the road. They are coming off a 69-68 overtime road win over the Arizona Rattlers in the Intense Conference Championship Game on June 23. They averaged 51.7 points per game and allowed 41.2 points per game during the regular season. 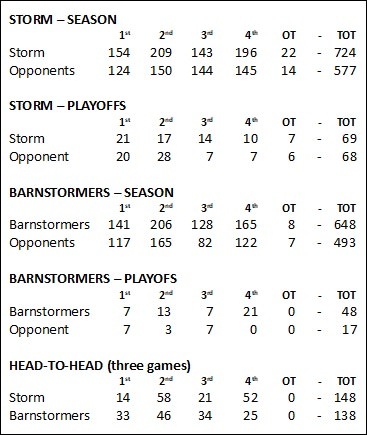 The Storm finished third in the final IFL standings. The Barnstormers finished the regular season at 11-3 overall and 7-1 at home. They are coming off a 48-17 home win over the Nebraska Danger in the United Championship Game on June 22. They averaged 46.3 points per game and allow 35.2 points per game during the regular season. The Barnstormers finished first in the IFL standings. QB Lorenzo Brown Jr., right, engineers the Storm offense against the Barnstormers in week 16. Roster information is subject to change and is presented here as a basic guide for following the game. Rosters and team information is gathered from the IFL's 2018 Media Guide, as well as other sources, and will be updated as further roster information becomes available. 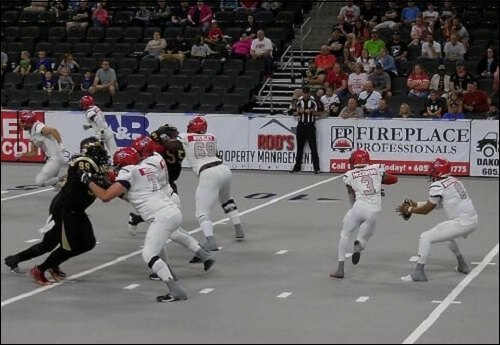 Barnstormers QB Drew Powell, second from left, leads the offense against the Storm in week 16. Roster information is subject to change and is presented here as a basic guide for following the game. Rosters and team information is gathered from the IFL's 2018 Media Guide and other sources, and will be updated as further roster information becomes available. It's finally here. Nearly five months since opening day, the United Bowl (United Bowl X) is upon us. 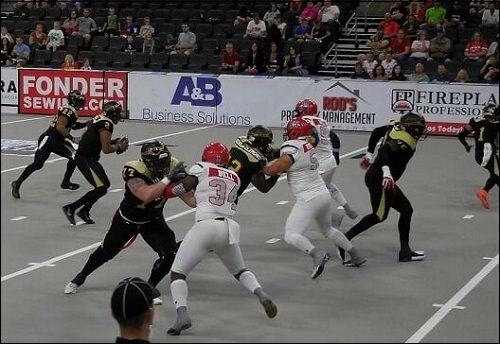 On one side is a team which is appearing in its ninth straight Indoor Football League Championship Game, while on the other side is another appearing in its first. However, with this one, the fan can toss history out the window. In what has been a thrilling IFL season, you have two of the IFL's top three teams which are separated by just a collective 10 points in their three head-to-head games over the course of the season. The first two games between the Storm and Barnstormers were won by the visiting team. That very well could have been the case in the third, had the Storm not blocked a long Barnstormers' field goal on the final play. Iowa recovered the ball, but in their end zone. The safety broke a 49-49 tie to give Sioux Falls the two-point win. Since moving over from the Arena Football League prior to the 2015 season, the Barnstormers have defeated the Storm just once in eight games, but with that win coming this season the Barnstormers will look to use it as a stepping stone to their first IFL championship. The Storm lead the overall series 7-1. The largest point disparity in the series came in their first meeting, an 87-11 win by the Storm on April 25, 2015. The teams met in last season's United Conference Championship Game with the Storm winning, 66-32. Sioux Falls ended the regular season by rattling off five straight wins, including a pair of thrillers in their final two weeks. The first is when they rallied to tie the Barnstormers in week 16. The Barnstormers attempted a long field goal on the final play of regulation, but it was blocked. The ball traveled into the end zone and was recovered by The Barnstormers as time expired in regulation to give the Storm the win. In the finale, they were tested by the Green Bay Blizzard. An interception by defensive back Trey Wafford on the second possession of the third overtime secured the 69-61 victory. The Storm have reached the United Bowl the past eight seasons, and won six straight United Bowls from 2011 to 2016. They advanced to the United Bowl with a thrilling 69-68 overtime win over the Arizona Rattlers in the Intense Conference Championship Game at Phoenix on June 23. In the conference title game, the defending IFL champion Rattlers appeared to be on the verge of making a return trip to the United Bowl as they led 48-35 with less than a minute left in the first half. The Storm, however, clawed their way back, tying it on Miles Bergner's 30-yard field goal with 1:19 left in regulation. The Rattlers scored first in overtime when quarterback Verlon Reed, Jr. found wide receiver Dezmon Epps for a 16-yard touchdown. Storm linebacker Dezmin Reed blocked Sawyer Petre's extra point attempt, opening the door for the Sioux Falls offense. The response came in one play as quarterback Lorenzo Brown, Jr. found wide receiver Damien Ford for a 20-yard touchdown. Bergner's extra point gave the Storm the one-point win to send them to this United Bowl. Brown threw for four touchdowns and rushed for another three while putting up 239 yards of total offense. Running back Lyle McCombs scored a touchdown on the ground and another through the air, and defensive back Damond Smith II paced the defense with 12.5 total tackles and a tackle for loss. Brown is a formidable, dual-threat IFL quarterback. He is a fixture near the top of most, if not all, IFL passing and rushing categories. He was second in passing yards per game with 157.4 and passing yards with 2,203 on the regular season. He ranked third in the league with his 38 passing touchdowns, and second among IFL quarterbacks in rushing with 607 yards and 24 touchdowns on the ground. Brown's experience could prove to be a key as he attempts to lead the Storm to a seventh United Bowl championship. McCombs is an excellent compliment in the rushing game. He ranked fourth in the IFL with 437 rushing yards (second among running backs) and 15 touchdowns. He also has caught 35 passes for 308 yards and a pair of touchdowns. Judd Harrold averaged 14.2 yards per catch and had 17 touchdowns through the air. He is a big target who creates difficulties for smaller opposing defensive backs. Ford toward the latter part of the season with 22 catches for 349 yards and 6 touchdowns. Mike Tatum, a receiving stalwart for the Storm, did not play toward the end of the regular season, but averaged 15.8 yards per game, good for third best in the IFL. Wafford, last season's Defensive Rookie of the Year, was spectacular for the Storm this season. He led the team in total tackles with 73.5. He also had four tackles for loss, 3 interceptions, 5 pass break ups and 4 fumble recoveries. Jabari Gorman recorded a team-leading five interceptions and 10 pass break ups to go along with his 70.5 total tackles. Owen Williams finished with four sacks and five tackles for loss. Bergner was the IFL's most accurate field goal kicker having completed 64.7 percent of his tries. He had longs of 45 yards which he nailed twice. He also was second in point after conversions, hitting 85.6 percent of those attempts, second by just a single percentage point to the Rattlers Petre in that category. 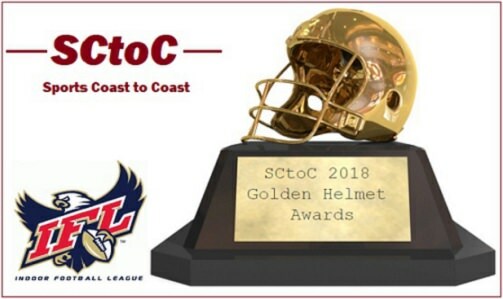 Last weekend Bergner was awarded the Golden Helmet Award as SCtoC's 2018 IFL Special Teams Player of the Year. 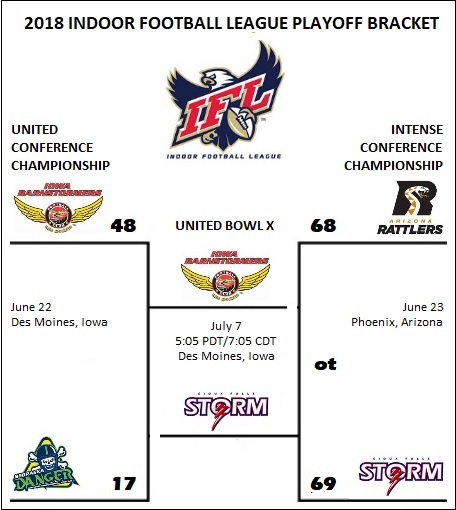 Despite the fluke blocked field goal turned into a safety resulting in a week 16 loss to the Sioux Falls Storm, the Barnstormers ensured themselves of home field advantage throughout the playoffs in the playoffs, including this United Bowl. The Barnstormers lost just three games this season, with their first match up against the Danger ending in favor of Nebraska. Iowa went undefeated during April and May, and rattled off seven straight wins after that loss to the Danger. They possess the league's best defense, arguably the IFL Offensive Most Valuable Player, and perhaps the best receiving duo in the league. Head coach Dixie Wooten, in his tweets, uses the hashtag #CHAMPIONSHIPMINDSET. Clearly, he is instilling that very sentiment in his players. Wooten is the recipient of the Golden Helmet Award as SCtoC's 2018 IFL Head Coach of the Year. The Barnstormers advanced to the United Bowl with a 48-17 win over the Danger in the United Conference Championship Game on June 22 at Des Moines. The Barnstormers outscored the Danger in the conference title game 41-7 over the final 35 minutes to cruise away with the 31-point win over Nebraska, which went into the game at 4-10 and as the fourth seed of the playoffs. The Danger actually led 10-7 after Brad Hatfield connected on a 24-yard field goal with 9:29 remaining in the second quarter. Iowa quarterback Drew Powell rushed for three touchdowns in the second and third quarters, and the Barnstormers were never seriously threatened afterward. They also outscored the Danger in the fourth quarter, 21-0 in the final quarter. Powell completed 77 percent of his passes with two touchdowns while rushing for three touchdowns on 48 yards rushing. Wide receiver Ryan Balentine caught a pair of touchdown passes, and linebacker Nakevion Leslie had eight total tackles, a sack and a tackle for loss to lead the defensive effort for Iowa in that game. Drew Powell is arguably the top quarterback in the IFL. He solidly led the IFL in total offense per game at 211.9 yards and 68.1 pass completion percentage. He threw for 34 touchdowns against just four interceptions on the season. He leads the IFL in rushing yards at 939 and was third in rushing touchdowns with 23. All this after having missed two games this season as he was trying out in the Canadian Football League. Had he played those two games, he might be leading the league in some of those other categories. Powell was honored last weekend with the Golden Helmet Award as SCtoC's 2018 IFL Offensive Player of the Year. Jamal Tyler and Donavan Williams are formidable at the running back spots. Tyler 4.5 yards per carry and scored four touchdowns in the regular season, including two in the regular season finale against the Cedar Rapids Titans. Williams boasts a 3.9 yards per carry average along with 10 rushing touchdowns during the regular season. Brady Roland led the league in receptions (60), receiving yards (793) and receiving touchdowns (20). Ryan Balentine as much as a threat with his 58 catches for 645 yards and 13 touchdowns. Sheldon Augustine, a potential threat in the kick return game, caught three touchdown passes on the season. The Barnstormers' defense is a mix of speed and strength. Defensive back Bryce Enyard's eight interceptions led the league in the regular season. He also had 69 total tackles and 13 pass break ups. Linebacker Zachary Allen led the team with 72 total tackles, and had seven tackles for loss and 1.5 sacks. Defensive lineman Keith Jones, Jr. has been outstanding as a pass rusher, compiling 12.5 tackles for loss to go along with his team-leading 4.5 sacks. Defensive backs Rocky Hayes and Jourdan Wickliffe had three fumble recoveries and three interceptions, respectively. Josh Gable took over the kicking duties during the season and recorded a kickoff average of 51.0 yards. He hit six of seven extra points in the conference championship game. Iowa had the staunchest defense in the IFL this season, allowing just 35.2 points per game, as well as just 17 in their playoff game which tied the lowest point total by any team in the IFL this season set in week 14 by the Green Bay Blizzard. On July 1, we announced our 2018 honorees as the top performers of the regular season. Click GOLDEN HELMET AWARDS to see that list and summaries in each of our eight categories. During United Bowl Weekend, the Indoor Football League will induct three stellar former players into the Hall of Fame. Those three passing into the Hall in 2018 are former Nebraska Danger linebacker (now Danger head coach) Cornelius "Pig Brown, Nebraska Danger quarterback Jameel Sewell and Sioux Falls Storm offensive lineman Charlie Sanders. I'm looking forward to an intense game. I bet the crowd in Des Moines will be rocking for this one. It would be amazing to witness it. It seems like these teams are really evenly matched. The QBs play kind of similar styles. It could very well come down to defense or a big play like the last game between them at the end. I can really see this going down to the final second. Incredible preview, Heidi. Thanks for all you have done with these this season, but this one is the best ever! I think the Storm will win yet another United Bowl. They are the Cleveland Cavaliers and the Barnstormers are the Toronto Raptors. Iowa just for the life of them can't beat Sioux Falls and if Iowa does best Sioux Falls tonight it would be their first win against them ever. Here we go. Barnstormers with the ball first. There are no live stats for the game. I don't get why the IFL is not having them during the playoffs. Well the people of Iowa are there to support their team. Touchdown Barnstormers. B.J. Butler 5 yard pass from Drew Powell. Josh Gable kick. LORENZO BROWN INTERCEPTION! The crowd is into this game and that is awesome. Can Iowa take advantage of the momentum? Brown intercepted. This potentially takes away the Storm's advantage of deferring the opening kickoff. Drew Powell almost ran to the house on that play. There's a great crowd for this game. Iowa tends to get good crowds to begin with. That was a missed opportunity by the Barnstormers to take a 2 possession lead. Tie game ladies. I'm curious to see how the Barnstormers bounce back. Touchdown Storm. Lorenzo Brown run. Miles Bergner kick.